Here you can find some information on the process for generalizing water features as shown in my current demonstration map. Since the process is quite complicated i split this into several sections. Generalized waterbody data is currently not available since the method is still highly experimental. 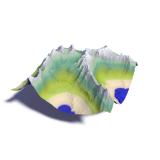 The new version of the coastline_gen tool however includes the functions necessary to generalize the water areas with proper separation and connections to the coastlines.